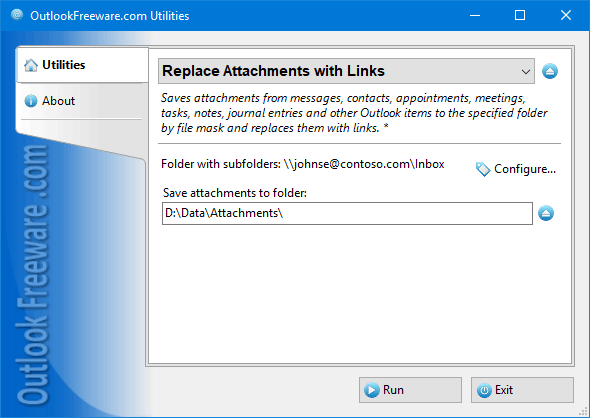 This free utility replaces file attachments in email messages, appointments, contacts, tasks, and other Outlook items with links. It moves attachments to a folder on your computer or network share and creates links referring to the saved files in your messages. The links appear in the usual place - on the attachments panel, and you can open them as normal attachments. Such replacement is absolutely safe: you can put the attachments back at any time using the Restore Attachments from Links utility. Free space in Exchange Server mailboxes and Outlook data files is a valuable resource. Most companies restrict user space, and when it runs out, you can't send and receive email messages any more. The maximum size of Outlook data files is also limited. Outlook works with large PST files unreliably, frequently hangs, and crashes. This leads to file structure corruptions and losing important data. Our utility allows you to free up space in mailboxes and Outlook data files. It is easy to install and use. Flexible settings allow you to replace attachments with links exactly as you need. You can save attachments, only of certain types, by mask. You can overwrite existing files or rename them automatically. The utility can save attachments to disk, creating the same folder structure you are using in Outlook. If necessary, you can limit the types of processed Outlook items and the date range. Selecting the network share as the destination folder enables access to attachment files of other users. This makes working with files easier, centralizes storage of attachments in a safe, secure dedicated place on file servers and network resources. An important advantage of this utility is the ability to replace attachments automatically with links in incoming mail, thanks to product integration with Outlook rules. Command line support allows you to use the utility in batch files, scripts and scheduled tasks. This free utility automatically imports folders with files on your disk or network share into Outlook, keeping the original folder structure and provides additional features. Free tool for importing Outlook contacts from NK2, DAT or XML autocomplete list cache files into the specified folder. This free utility creates Outlook contacts from Auto-Complete Lists.